Just like the Apostles, there were only ever 13 Mechanised Corps in the Red Army. Their forerunners were all destroyed or disbanded in the initial German advance of June 1941 and when the Red Army came to reform them in September 1942 just six of these divisional sized units were raised. A further two Guards Corps were formed in November, followed by three more Corps and a further Guard Corps in January 1943 and a final one in June 1943. With four regular Corps converted to Guard Corps during 1943, this gave a total of five Corps and eight Guard Corps by the end of the year. Given that there were over thirty Tank Corps and literally hundreds of Rifle Divisions, this handful of Mechanised Corps represented a tiny proportion of the overall Red Army and almost as rare as the six, albeit much larger Tank Armies. So why are these very rare beasts of interest and why are they so important? The importance of the Mechanised Corps lies in the fact that one of them was at the heart of every Tank Army or group of Tank Armies and provided the infantry stability required to seize and hold objectives, cross water obstacles and defend in depth. Tank Armies operated to a large extent only in the south of the USSR with the sole exception being the 5th Guards Tank Army's appearance during Operation" Bagration" in June 1944. For the northern group of Fronts, the Mechanised Corps represented their mobile assault forces and they often deployed to lead assaults such as the Rzhev-Sychevskaya Strategic Offensive which was involved 1 and 3 Mechanised Corps advancing from the south-west of the salient. THis means that tracing Mechanised Corps are a good way to identify STAVKAs areas of strategic importance for the northern group of Fronts. Mechanised Corps were by the far the largest, most expensive, lavishly equipped, divisional sized units in the whole of the Red Army and unlike Rifle Divisions which were left to wither on the vine in between operations, the Centre strove to keep Mechanised Corps as close to their establishment strength as possible. 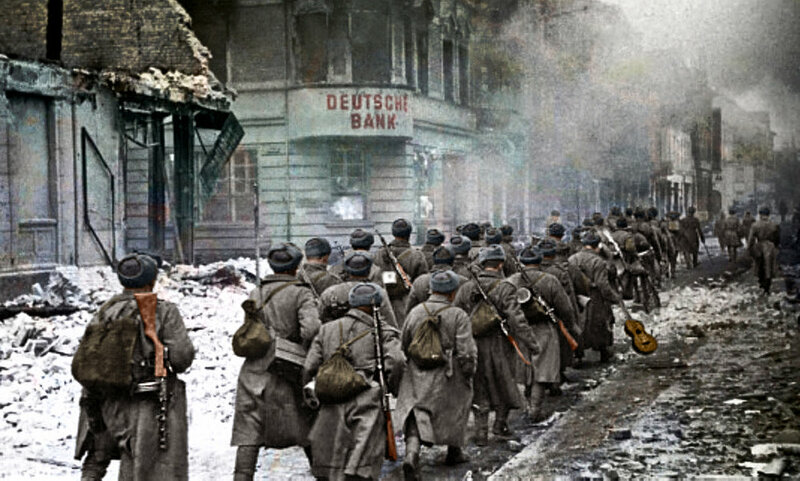 They were twice or even three times the size of an average Rifle Division on operations. A Tank Corps with three Tank Brigades and a single Motor Rifle Brigade represented a large mass of 168 tanks supported by just 13 small rifle companies and 24 field guns while on the other hand a Mechanised Corps had at least 175 tanks and 33 rifle companies, although its only artillery were 36 field. Neither of these two units corresponded to Western ideas of a typical Tank Division which was a balanced formation of tanks infantry and supporting artillery. By comparison a mid war Panzer Division possessed 180 tanks, 13 rifle companies, 24, 10.5cm howitzers and 12, 15cm heavy howitzers. Although the Mechanised Corps received their fair share of T-34 tanks because they were available, they also received a good proportion of D.P.P. tanks, especially Lend Lease ones, with the 5 Mechanised Corps fully outfitted with British Matildas in 1942. This focus on D.P.P. tanks showed that they were 'motorised infantry formations supported by tanks' and not tank formations even though Mechanised Corps often fielded more vehicles than equivalent Tank Corps. This is the reason that Mechanised Corps were used as assault forces because their large, relatively mobile lorry-borne infantry force, supported by tanks offered a good combination of offensive capability coupled with the potential for rapid exploitation and the ability to hold those positions once captured. Yet this capability was expensive to build and maintain, consuming scarce resources at a frightening rate and so the Main Directorate of Armoured and Mechanised Troops of the Red Army concentrated on maintaining the existing units and did not create new ones. There are two main sources on the organisation of armoured troops, in English Zaloga & Ness "The Red Army handbook" and in Russian, O.A. Losik "Construction and operational use of Soviet tank forces during the Great Patriotic War" however neither of these sources give a high level of detail about Mechanised Corps, preferring, instead to cover the smaller Mechanised Brigades. For instance Zaloga & Ness devote 14 pages to Tank Corps and only 4 pages to Mechanised Corps with just one table devoted to Mechanised Corps and three to Motor Rifle/ Mechanised Brigades. Much of the information given in Zaloga & Ness is from German intelligence reports and as such contains errors and lacks detail, so much so that it has not been possible to determine an establishment for Mechanised Corps and only outline ones for Brigades. This situation began to charge after 2000 and since then a steady trickle of new information derived by Russian scholars from the archives or published online on websites such as www.pamyat-naroda.ru have widened our knowledge of these intriguing formations. The first of these documents is given below in translation from Отдел Управления формирования и Укомплектования БТ и МВ КА Department of Formation and Staffing of Armoured and Mechanised Troops of Red Army - "Доклад о Развитии Бронетанковых и Механизированных Войск Красной Армии в Ходе Великой Отечественной Войны" - "Report on the Development of the Armoured and Mechanised Troops of the Red Army in the Course of the Great Patriotic War". The report is an end of war report outlining the history of formation of armoured troops during the war and their changing organisation. It is intended to add further documents in later blogs. "Suddenness acts overwhelmingly. The suddenness of the attack is half-way to success." One of the elements of achieving suddenness is the mobility of military units. The motorized rifle brigade - rifle divisions mounted on vehicles possesses high mobility - was again brought to life by the existing situation. Again because the motorized divisions of pre-war time were disbanded from the beginning of the war until March 1942, there were no motorized units in the Armoured and Mechanised Troops. The first motorised rifle brigades were formed according to the state 010 / 370-010 /380 developed and approved in March 1942. Such a motorised brigade having in its establishment artillery, mortars anti-aircraft and anti-tank weapons mechanised, it could perform independent tactical tasks. The most characteristic combat actions of such units were. A / the brigade's actions as a forward detachment-the seizure of advantageous lines and the retention of them until the main forces approach. B / Parallel pursuit of the retreating enemy cuts off their escape. V / Mobile reserve of the Army Command for preventing accidents. G / Interaction with tank supports in the breakthrough of enemy defences and action in the depth of defence. The mechanized brigades did not have their own special State but were kept in the same State with the introduction of the Tank Regiment in State No. 010/292 then 010/414 and finally No. 010/465. The departments of motorized rifle and mechanized brigades generally did not follow the number of corps and included: motorized rifle brigades in Tank Corps who worked closely with tank brigades. 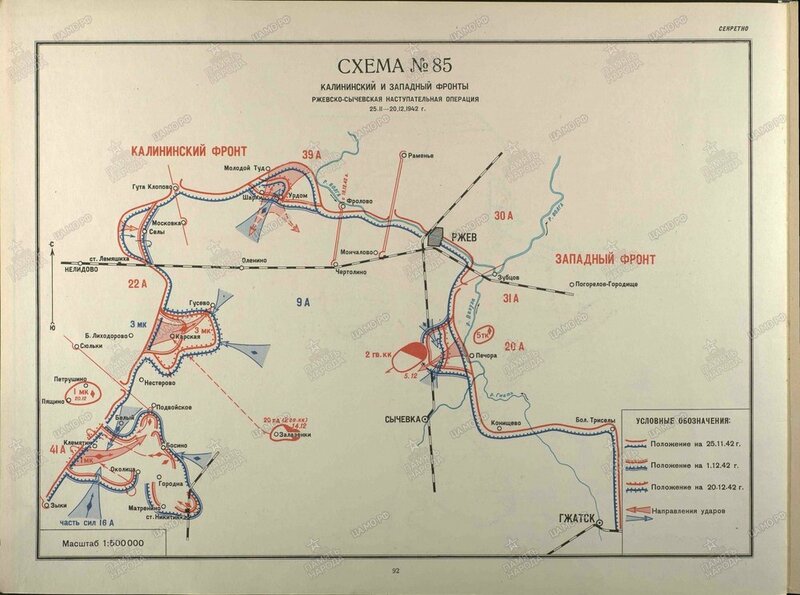 It was necessary to organize close interaction of tank assaults with rifle formations; Mechanized brigades in Corps acted as the main impact force of the Corps. The States of the Motorized brigade were revised in 1943 and the new one No. 010 / 420-010 / 431 were approved in February 1943. 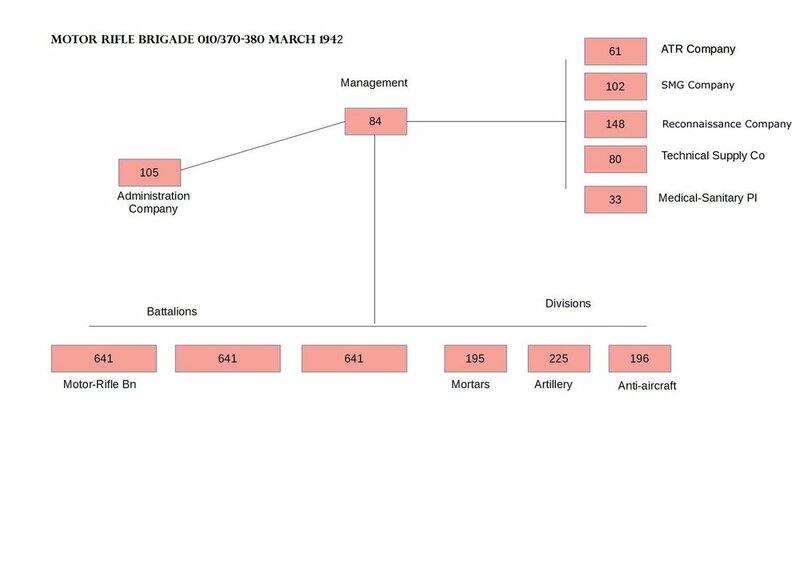 The organizational structure of the brigade in State No. 010 / 420-010 / 431 was similar to the brigade State No. 010 / 370-010 / 380. Scheme of organisation of the brigade for the states No. 010 / 420-010 / 431. 1. Motor vehicles provided for the transport of personnel were grouped into a Company and subordinated to the management of the brigade, which contributed to the ordering of them as transport, they allowed greater opportunities for the transfer of units of the brigade. 2. Offensive operational forces of the troops urgently demanded constant engineering support: ensuring the crossing of the water obstacles, the restoration of roads, demining, etc. Therefore, the engineer-mine company was introduced into the brigade. 3. Anti-Aircraft Artillery Division turned out to be very difficult for the brigade, so it was not included in the brigade in 1942, and the establishment of the brigade introduced. the anti-aircraft machine-gun company State No. 010/451 of 50 people and 9 anti-aircraft machine guns of the DShK defended the units of the brigade sufficiently from the enemy air attack, preventing the aircraft from dropping and aiming for bombing and firing. In this organization, the motor-rifle and mechanized brigades remained until the end of the war. 1/. The first two mechanised corps were formed by the subordination of the directive NKO 1104308ss of September 8, 1942, case 13a p. 159 /. Scheme 5 of the Mechanised Corps Organisation. This organisation of mechanised corps includes 1 and 2 Mech Corps. The 3rd and 5th MС consisted of two tank brigades in the state No. 010 / 240-010 / 247, and in 4 and 6 MС the tank brigades were replaced by two tank regiments in the state 010/292. In all the corps with such an organization were five tank regiments. 2 /. Directive NKO No. 1104396 of September 13, 1942, of the compostion of Tank Brigades state 010/240-010/247 includes an AA battery state No. 010/243 consisting of 37 mm guns-2, DshK-4. 3 /. Directive NKO No. 1104478 of September 17, 1942, added to the Corps a motorcycle battalion state No. 010/353 of 237 people. 4/. Directive NKO No. 1105709 of November 26, 1942, is included in the corps. a) Medical-Sanitary battalion staff No. 04/566, number - 103 people. b) Field bakery plant state № 04/567, number - 94 people. c) Field office of the State Bank's staff No. 04/16, numbering 3 people. States No. 04/566 and 04/567 remained unchanged, however the group "04" was replaced by the group "010", which changed only the number of states. 5/. By Order No. 019 of January 10, 1943, the following changes were made to the structure of the corps. a / From the composition of Mechanised Brigades eliminated the anti-aircraft battalion state No. 010/374. b / The company of delivery of fuel, contained in staff No. 018/388 transferred from the letter "B" to letter "A". c / The Repair Battalion was transferred from State No. 10/381 to State No. 010/415. d / The Army Air Defense Regiment - State No. 08/138 is excluded from the composition of the Mech Corps. b / Self-propelled artillery regiment of the RGK for staff No. 08/158 with the number of personnel - 304 SU-12/76 / - 17, SU-35/122 / - 8 pieces. 7 /. By Order No. 066 of January 23, 1943, a reserve of tanks and drivers/ tanks-T-34-33 and T-70-7 was added to the structure of the corps, personnel - 247 of them. crews - 147, drivers - 100 /. 8/. By the Decree of the GFCS 2306cc of January 30, 1943, the newly formed MCs exclude Gd. Mortar divisions in staff No. 08/83, and in the existing MK are kept until special instructions. 9/. Directive NKO No. 1124821ss of February 22, 1943 in two Mechanised Corps introduced sapper battalion in the state number 010/562, the number - 491 people. 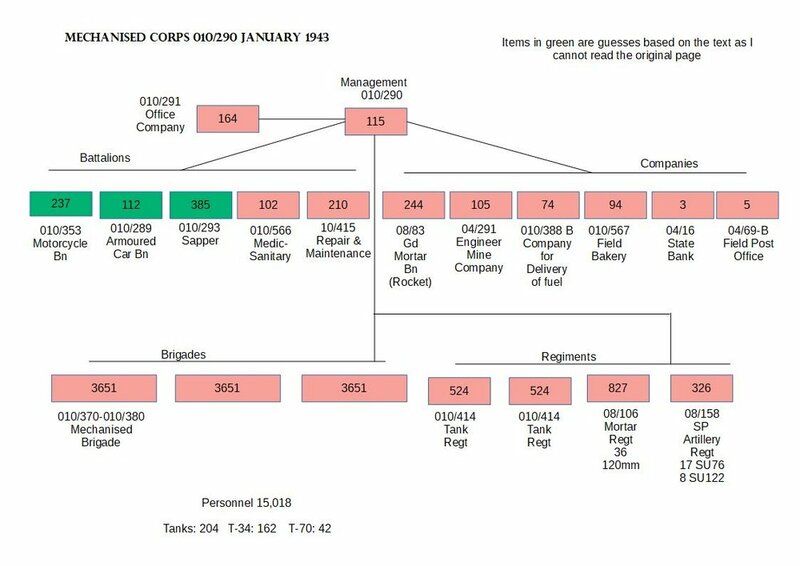 Engineering and mine companies are excluded from the structure of the Corps. Further replacement of Engineer-Mine Companies of the Sapper Battalions were created in the Corps as they were removed following individual directives for each Corps. 10. The Directive of the deputy NKO No. 1125236 of 21. March 1943 - Staff of the Mech Corps State 010/290 exchanged for State No. 010/418. The Administration Company of the Corps State No. 010/291 was reorganised into a Communications Battalion State No. 010/561. 11. By Order NKO No. 0207 of March 27, the military-postal service No. 014/97-A, numbering 5 people, was put into the corps. a / In Tank Brigade and Mech Brigade – AA Artillery Company State No. 010/451. б / AA Artillery Regiment State № 010/452, the number of personnel - 397 people - 37 mm guns - 16, DshK 12.7mm HMG – 16. 13/. Directive No. 1125607 of April 12, 1943, introduced into the Corps establishment an Aviation Communication Section State No. 015/204, the number of personnel is 12, and the number of aircraft is 3. 14/. The NKO Directive No. 0260 of April 13, 1943, introduced Tank Brigade State 010/418 into the Corps establishment. 15 /. On the basis of the personal order of the NKO Comrade. STALIN in April 1943, the Corps added the Destroyer-Antitank Artillery Regiment State No. 08/100, the number of personnel - 260 people, 45 mm guns - 20 pieces. 15a/. By the instruction of the GOKO No. 3992 of May 18, 1943, the establishment of the Mech Corps added Anti-tank Artillery Battalion State No. 010/466 with the number of 238 people, 85 mm guns – 12. 16/. Directive Deputy. NGO No. 1126341 of May 19, 1943 Self-propelled Art. Regiment is transferred to a new State. The Regiment remained State 08/218 with twelve SU-76 and eight SU-122 while State No. 08/158 transferred to the state number 010/454 - with twelve SU-152 and one KV-1. According to this directive, a Mixed Self-propelled Art. Regt in the Mech Corps under Order Number 020 transferred to the State Heavy Self Propelled Art. Regiment SU-152 as well as all Self-propelled Art. Regts outside the establishment of the Corps with State No. 08/291 were transferred to State No. 010/453 with sixteen SU-122 and one T-34. 17 /. Directive GShKA No. Org/3/2116 dated June 27, 1943, the establishment of the Corps introduced a Chemical Defence Company State number 010/563, the number - 50 people. 18/. By the order of NKO No. 0402 of July 11, 1943, the establishment of the Mech Corps added a reserve of officers numbering 50 people. 19/. Directive GShKA No. 0g / 2/1416 of August 21, 1943 in the Mech Corps introduced a workshop of clothing property State number 04/215 - 11 people. a / Gd. Mortar Battalion (Rocket) State No. 08.83. Previously existing in the corps, but excluded from its establishment in accordance with the Resolution of the GOKO No. 2806ss of January 30, 1943.
b / Self-propelled art. regiment SU-76 State No. 010/455, in exchange for the anti-tank regiment / State No. 08/100 /. c / Self-propelled art. regiment SU-85 State No. 010/453 in place of the Destroyer anti-tank battalion of 85 mm cannon State No. 010/466 /. SU-76 - SAU. installations "SU-76" - 21 pcs. SU-122 - SAU. installations "SU-122" - 16. T-34 – 1. SU-152 from State No. 010/454 to state No. 010/482. 010/482 - personnel - 234 SU-152 - 12, KV - 1. 23 /. the directive GShKA No. Org / 3/2203 dated October 11, 1943, an armored car battalion / state No. 010/289 was excluded from the establishment of independent Corps, (ie. not part of Tank Armies) instead of it, a motorcycle battalion State 010/487, the number - 451 people. In the establishment of Corps that are not part of TA, KOP (Corps Exchange Point) was introduced State No. 010/486, with a strength of 27 people. 24). Directive GSG No. Org / 3/2222 of November 5, 1943 armored vehicles and armored transport battalions were disbanded in all corps and in place of them motorcycle battalions were formed in State No. 010/487. 25 /. the directive of the GShKA No. Org / 3/2232 of November 30, 1943, the Mechanised Brigade of the Corps, transferred from the state No. 010/270-010/277, 010/375, 010/451/ 53 tanks / to state No. 010/500-010/506/ 65 tanks. Reserve of tanks and drivers disbanded. The transfer of brigades to the new states did not take place in all cases for a long time. Establishment of Mech Corps on January 1, 1944, was as follows. Administration of Corps State 010/418 ............................ - 196 people. Mech brigade staff number 010 / 420-010 / 431, 010/414 .....- 3685 people. 26 /. Directive GShKA No. Орг / 3/305995 of February 28, 1944 self-propelled regiments SU-152 transferred from the state 010/482 to the state 010/461 with number of personnel - 420 people SU-152 - 21 pcs. 27 /. Directive of the GShK No. Org / 3 / 305995-6 of February 28, 1944, the SU-85 self-propelled regiments were transferred from State No. 010/483 to staff No. 010/462 with the strength of 318 SU-85 personnel - 21 units. 28 /. Directive GShKA No. Org / 3/309678 from June 16, 1944 State No. 010/418 - Administration of the Tank Corps and Mech Corps was added Administrative Office of the Artillery Commander with a strength of 22 men. 29 /. Directive GGSKA. # Орг / 3/310052 from June 24, 1944 in the units of Mech Corps has introduced an Artillery workshop State No. 010/135, number - 28 people. 30/. Directive GShKA l Org / 3/310051 dated June 26, 1944, Guards Mortar Division in the corps was transferred from State No. 08/83 to staff No. 010/514, with a strength of 207 men. / the number of M-13 remains the same - 8, staff of 010/514 reduced two 37 mm guns. 31 /. Order of Deputy. NKO No. 0245 of August 6, 1944, the infantry squad of the counterintelligence department "SMERSH" was sent to the staff No. 010/515, numbering 15 people. 32 /. Directives GShK №№ Орг / 3/2594 - 2599 from September 28 in the composition of all the Mech Corps including those attached to Tank Armies introduced KOP State number 010/486, with - 27 people. 34 /. Directive GShKA No. Org Org / 3/11041 dated 23.2.455 the reserve of officers in Mech Corps is reduced; contains instead of 50 people – 30. Office buildings - 010/418 - 204 people. Mechanized brigade - 010 / 420-010 / 431, 010/465, 010/451 ........... - 3614 people. Tank brigade is 010 / 500-010 / 506, 010/516 ..................................... ...... - 1362 people. Self-propelled art. regiment - SU-152 № 010/461 ..................................... - 420 people. Self-propelled art. regiment - SU-85 № 010/462 ..................................... - 313 people. Self-propelled art. regiment - SU-76 № 010/484 ......................................... .. - 235 people. mortar regiment No. 08/540 ............................................ .................. - 596 people. Anti-aircraft regiment is 010/452 ............................................ .. - 397 people. Gu. Mortar Division - 08/86 (010/514).................................... .. - 203 people. Motorcycle Battalion - 010/487 ............................................ ...... - 461 people. Communication Battalion - 010/561 ............................................ .. - 304 people. Aviation link -015/204 ............................................ .......................... - 11 people. Company for Chemical protection - 010/563 ............................................. .. - 49 people. Sapper Battalion - 010/562 ............................................ ......... - 455 people. Medical-Sanitary Battalion - 010/566 .......................................... ..... - 101 people. The company of delivery of fuel - 010/388-A ......................................... ...... - 116 people. PAX (Field Bakery) - 010/567 ……………………………………………..- 94 people. KON (Corps Exchange Point) - 010/486 ............................................. ................... - 27 people. PRB (Repair Bn) / tanks./ - 016/405 ......................................... .... - 103 people. PRB / wheeled./ - 032/87 .............................................. ............................ - 70 people. Rifle Platoon of "SMERSH" department - 010/515 ......................................... ............... - 15 people. Workshop for uniform repair - 04/215 ............................................. ... - 11 people. Artillery Repair workshop - 010/135 ............................................. ...... - 28 people. Military postal station - 014/97-А ........................................ .................... - 7 people. Gosbank's field office - 04/16 ........................................... ......... - 3 people. This organisation currently contains all 13 Mechanised Corps except 6 Gd. Corps, which instead of the tank brigade, has two tank regiments in the state No. 010/465. 1. The Mechanised Corps, unlike the Tank Corps, underwent less organisational change. The staff number of personnel for the entire period from September 8 to May 1, 1945 increased by only 2,863 people, as in the tank corps, the increase in personnel is 6,047. In per capita ratio, the increase in personnel is expressed: Mech Corps - 21% for Tank Corps - 114%. This is clarified by the fact that the MC was building on the experience of the development of the tank corps and immediately in its original organization, reinforcements and rear units. / Schemes No. 1 and 5 /. 2. The armament of the corps changed mainly due to the introduction of self-propelled art. regiments, 120 mm mortars and an increase in automatic weapons. In relation to tanks and other weapons, the corps has minor changes. 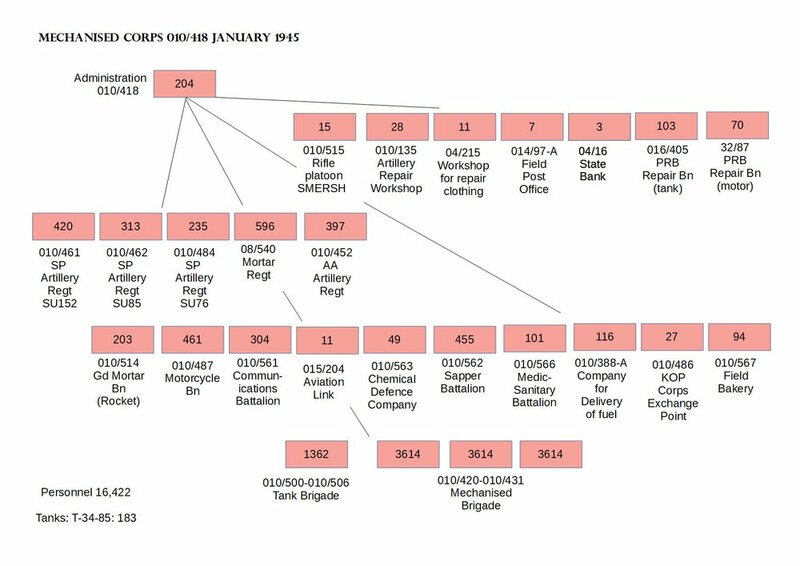 All the above schemes and comparative tables for the development of the Tank and Mechanized Corps are given as of the beginning of their relocation and on January 1 of each year. 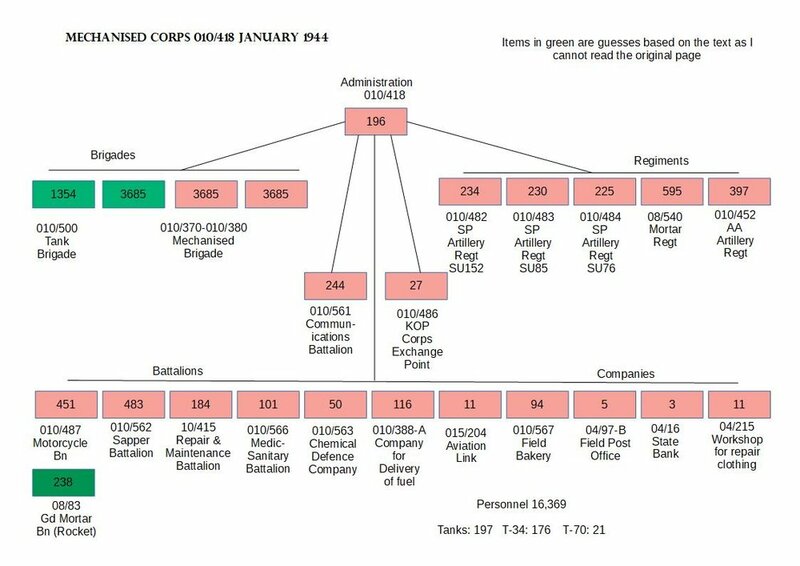 When determining the composition of corps for a certain period associated with the conduct of one or another combat operation / for any month of the year, it is necessary to make organizational changes in the schemes that took place before the start of the operation, taking as the basis the organization of the corps on January 1 of the year of interest.